For courses in the principles of microeconomics. One of the challenges of teaching principles of microeconomics is fostering interest in concepts that may not seem applicable to students’ lives. Microeconomics makes this topic relevant by demonstrating how real businesses use microeconomics to make decisions every day. With ever-changing US and world economies, the 7th Edition has been updated with the latest developments using new real-world business and policy examples. Regardless of their future career path -- opening an art studio, trading on Wall Street, or bartending at the local pub, students will benefit from understanding the economic forces behind their work. By combining trusted author content with digital tools and a flexible platform, MyLab personalizes the learning experience and improves results for each student. Note: You are purchasing a standalone product; MyLab Economics does not come packaged with this content. Students, if interested in purchasing this title with MyLab Economics, ask your instructor to confirm the correct package ISBN and Course ID. Instructors, contact your Pearson representative for more information. R. Glenn Hubbard, policymaker, professor, and researcher. Hubbard is the dean and Russell L. Carson Professor of Finance and Economics in the Graduate School of Business at Columbia University, and professor of economics in Columbia’s Faculty of Arts and Sciences. He is also a research associate of the National Bureau of Economic Research and a director of Automatic Data Processing, Black Rock Closed-End Funds, and MetLife. He received his PhD in economics from Harvard University in 1983. From 2001 to 2003, he served as chairman of the White House Council of Economic Advisers and chairman of the OECD Economic Policy Committee, and from 1991 to 1993, he was deputy assistant secretary of the US Treasury Department. He currently serves as co-chair of the nonpartisan Committee on Capital Markets Regulation. 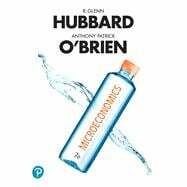 Hubbard’s fields of specialization are public economics, financial markets and institutions, corporate finance, macroeconomics, industrial organization, and public policy. He is the author of more than 100 articles in leading journals, including American Economic Review, Brookings Papers on Economic Activity, Journal of Finance, Journal of Financial Economics, Journal of Money, Credit, and Banking, Journal of Political Economy, Journal of Public Economics, Quarterly Journal of Economics, RAND Journal of Economics, and Review of Economics and Statistics. His research has been supported by grants from the National Science Foundation, the National Bureau of Economic Research, and numerous private foundations. Tony O’Brien, award-winning professor and researcher. O’Brien is a professor of economics at Lehigh University. He received his PhD from the University of California, Berkeley, in 1987. He has taught principles of economics for more than 20 years, in both large sections and small honors classes. He received the Lehigh University Award for Distinguished Teaching. He was formerly the director of the Diamond Center for Economic Education and was named a Dana Foundation Faculty Fellow and Lehigh Class of 1961 Professor of Economics. He has been a visiting professor at the University of California, Santa Barbara, and the Graduate School of Industrial Administration at Carnegie Mellon University. O’Brien’s research has dealt with issues such as the evolution of the US automobile industry, the sources of US economic competitiveness, the development of US trade policy, the causes of the Great Depression, and the causes of black–white income differences. His research has been published in leading journals, including American Economic Review, Quarterly Journal of Economics, Journal of Money, Credit, and Banking, Industrial Relations, Journal of Economic History, and Explorations in Economic History. His research has been supported by grants from government agencies and private foundations.